To set the record straight, old National Highway 2 (NH2) is now rechristened NH19. A portion of the highway is part of the vintage Grand Trunk Road, built partially by Chandragupta Maurya and enhanced by Sher Shah Suri. For centuries, this had been one of the most important routes for trade as well as for invasions. NH2 originates in Delhi and passes through Mathura, Agra, Allahabad, Varanasi and Dhanbad before terminating at Kolkata. 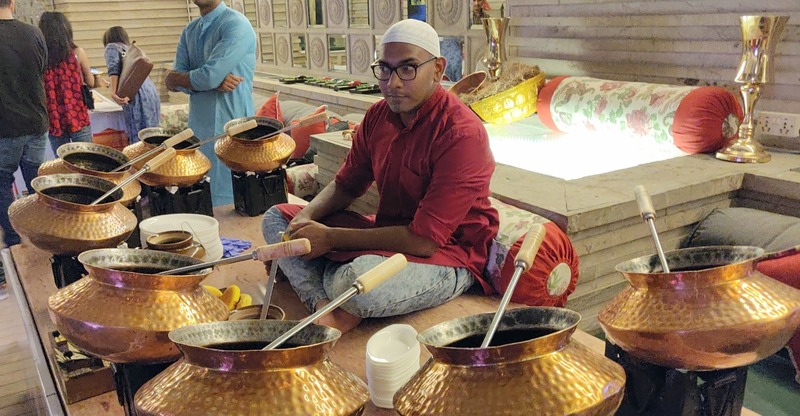 Executive Chef of Marriott Hyderabad Aungshuman Chakraborty is a diligent man, and even for this festival, I admire the sheer efforts put by him. A team of four chefs led by him travelled along the highway visiting the important destinations, sampling the food, studying the processes and even cooking with the vendors at times so that he can present the dishes in the most authentic way. Delhi and Kolkata being huge in terms of street food have been allocated booths under which all food kiosks from these cities have been placed. The towns of UP and Bihar have their stalls in the al-fresco open space. I started my journey with a welcome drink, a rum concoction in a typical quarter bottle. The drink tasted a tad like the "Desi santra" we used to drink in Benaras during my student years. My next stop was to the Bihar stalls, as my long stay in the Bhojpur region has endeared that cuisine to me. The Ahuna Mutton of Champaran and Dehati Chicken preparations both slow-cooked in earthen pots were outstanding. Sattu Paratha was the other attraction at this counter At the Litti Chokha station my focus was more on the varieties of chokha – potato, brinjal and tomato. 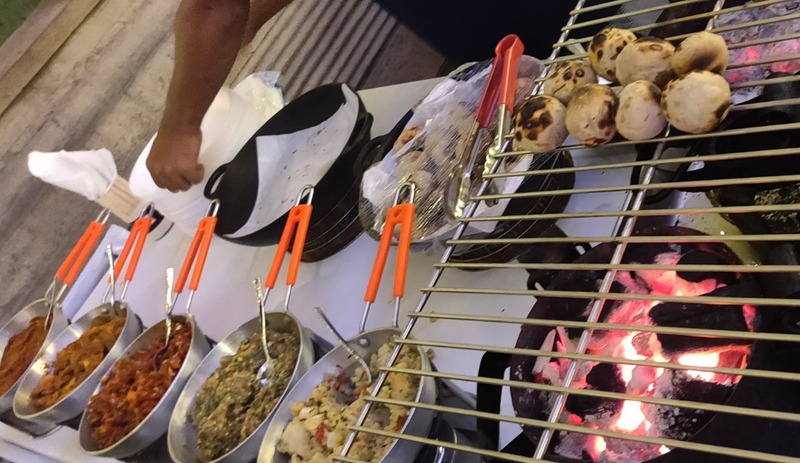 The litti was a little underdone, but that was the first day of the fest, my feedback about this and how to serve it doused in ghee were promptly passed over. Over to the Agra stall next, highlight here was the Bedai Poori with Alu ke SabziThe dal stuffed poori also known as Bedmi is popular in Delhi too, essentially as a breakfast item. There was a separate counter for the Agra Chaat too. Next to the Agra stall, there was Mathura with its range of sweets – peda, petha, malpua and imarti among others. I did not try the sweets for a reason - I was smarting from being freshly scolded by my doctor only two days back about keeping my blood sugar levels in check. A friend who were hogging along was almost singing paeans about the malpua. Suddenly, I heard Netaji's clarion call “Dilli chalo”. The Delhi booth had around eight counters, and I was given a tour of them by ever-smiling Chef Pawan Manhas. A stall was serving Chur Chur Naan thalis. There were alu, pyaaz, gobi and missi variants served in the thali with kali dal, chhole and achar. I did not dare to go for the entire thali and tried a little from a friend’s plate. At the “Parathe Wali Galli” nearby, there were about nine varieties of parathas. Again I had a bite from a neighbouring plate. Rabri Paratha was a dish here which looked interesting. The person next door was sitting on a low stool and serving nankhatai with tea. Nankhatai reminds me of the “Halwawala” song from my childhood. I had once watched a vendor making these biscuits in Delhi, which are popular with the evening tea. At the extreme right, there was this Kachori and Samosa stall serving stuff like Kachori Moth, Tikki Chhole and Moong Dal Samosa. Another stall had Chhole Bhature and Chhole Kulche. Two of the most popular stalls were Tejinder (Rajinder?) 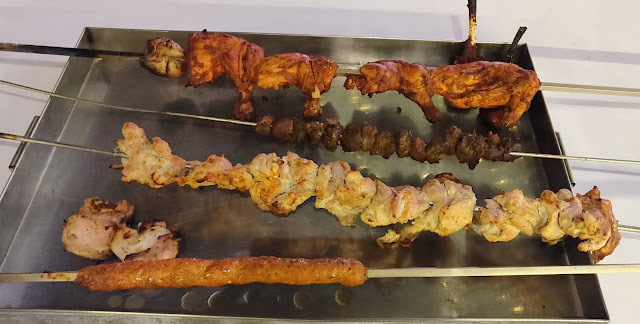 Dhaba with its range of kababs, as well as a stall from the by-lanes of Jama Masjid with stuff like Qorma, Keema, Stew and Butter chicken Old Delhi style. My pick here was the butter chicken and sheermal combo. I must have missed a few stalls, but there was no way I would not spare some space for the Kolkata booth. Started with phuchka (now phuchka is phuchka, not like its poorer cousins panipuri or golgappe), customized a couple of them, and they worked well. It was good to see that they got the “phuchkar jol” (pani) right. 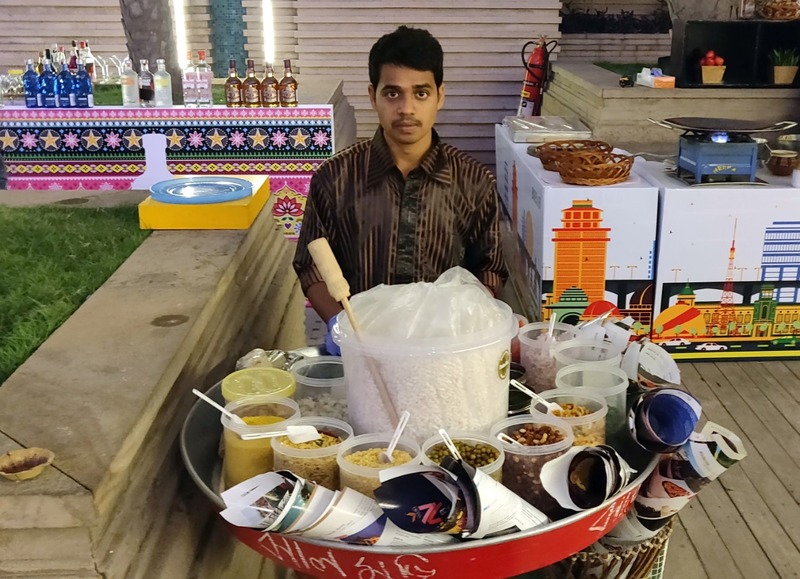 The Jhal Muri guy next door needs a bit of practice though to get the optimum taste of the snack. The large stall in the Kolkata booth was “Chinatown”. 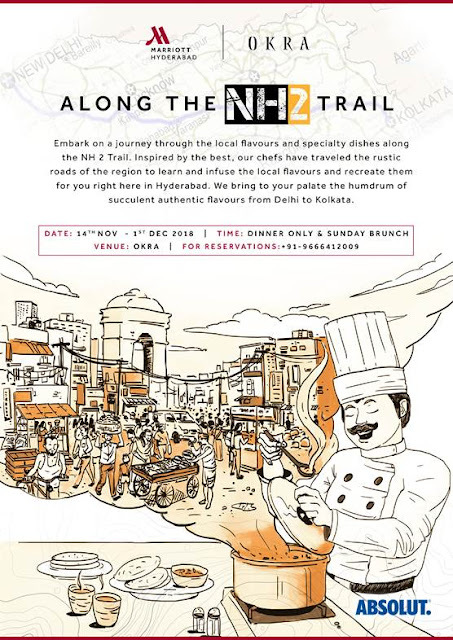 Hyderabad is fairly familiar with Tangra cuisine with the opening and subsequent closing of Kafulok, and the special Tangra menu at Zega, Sheraton. The menu at the stall had Bao, Meat Ball soup, Chilli Chicken and Sweet and Sour Pork among other dishes. I would have loved the meat ball to be mutton rather than chicken. The stir fried Sweet and Sour Pork worked for me. Next door there was this guy making kathi rolls. Fortunately in Hyderabad outlets like “Roll Call” make decent rolls, and I was fresh out of the Durga Puja and Kali Puja hangover. So, I skipped this, and went to the next hybrid stall. Hybrid because they were selling telebhaja (Beguni, Pyaaji and Alur Chop), Chop/cutlet (fish chop, dimer devil and fish fry) and the Muslim Chaap dishes (Chicken and mutton). I advised the guy to separate the chaaps from the chops, as they do not go hand in hand. The chaap masala was very well made, though I felt there should have been a rumali roti supply somewhere close. Finally, there was Chello Kabab, a famed Park Street dish (with kababs, rice, grilled veggies and eggs sunny side up) from Peter Cat. 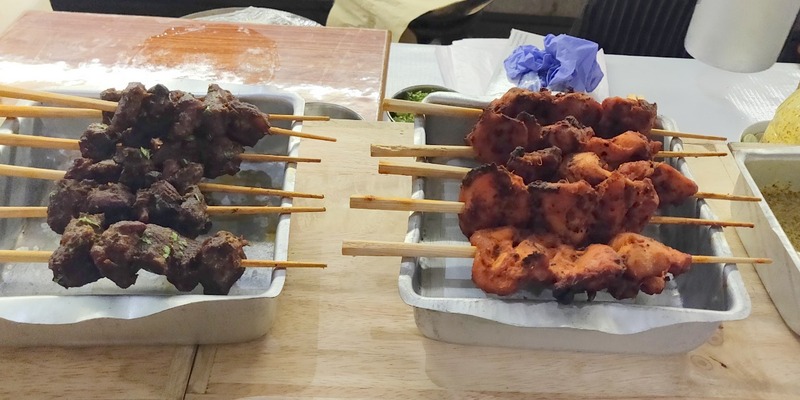 The stall was rightly providing a small sampler as the whole dish is heavy and would have prevented sampling of other delicacies. My food journey was complete by now, and I was totally contented. But to my misery, I was advised to check the buffet inside which I thought would have been the usual multi-cuisine stuff. But no, even that had some NH2 dishes including Rezala, Golbarir Kasha Mangsho and few more Bengali delicacies. I was distraught that I could not try the first two, as I was literally bursting at my seams. This is a festival which in my opinion can serve as a blueprint for star hotels in terms of researching the food. In fact, this is three fests rolled into one. The width of the menu has been maintained without sacrificing the details in depth. I feel to do justice to this fest, one needs to make at least a couple of visits. I would end my monologue by commending Chef Aungshuman and team for the effort going into the making of the fest. 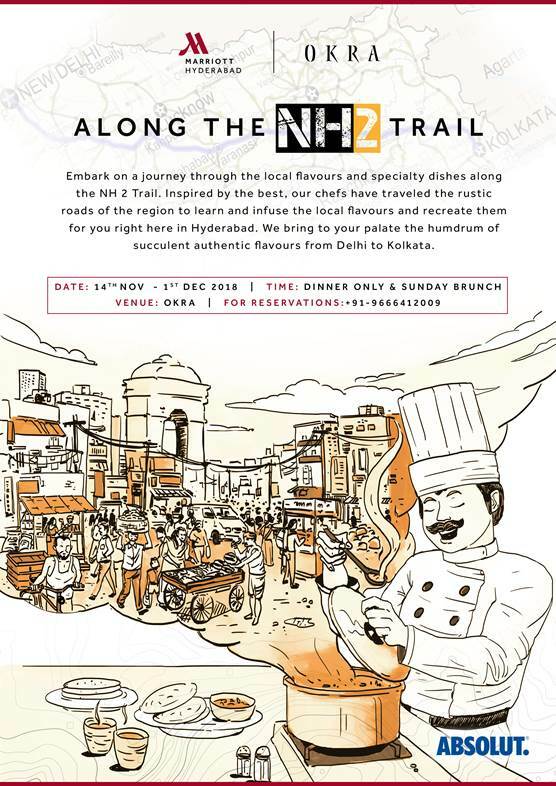 The festival is on from 14th December till 1st December for dinner only (except for the Sunday brunch) at Okra, the all-day dining restaurant of The Marriott Hyderabad.